This fun story of part of "the Superman Legend" was written by Otto Binder, penciled by Curt Swan, and inked by George Klein. Tell me, if a piece of Kryptonite could think, what would it be cogitatin' about? Would it look forward to fulfilling its niche in its existence by happily irradiating any and all Kryptonians? No! Isn't that a great splash panel? Superman's standing there, looking at a piece of Green Kryptonite NOT KILLING HIM. While the rock (and the readers) are shouting, "turn around, you big Super-Doofus! That rock is making your friends sick!" Isn't it tricky and fun, that there's a primitively suggested face drawn onto the surface of this softball-sized rock? On this page, we see how this poor piece of irradiated mineral has had its lethal fate thrust -- thrust, I say! -- upon it, causing pain to younger versions of the adult Superman. Our story proper begins on the next page. The final panel of the flashback brings us up to speed. When the Kryptonite became temporarily harmless, the then-Superboy tossed it into "the desolate Arctic!" Over which, a decade or so later, Clark Kent and other passengers are now flying in a commercial aircraft. This must have been one of those times when Superman gritted his figurative teeth and traveled like an ordinary human, to maintain his Earthly identity. After all, it might look sort of suspicious for Clark Kent to teletype his story from Madrid or Malaysia, and ten minutes later show up at the Daily Planet offices saying, "Well, I'm back!" And it's a good thing, too, because this plane is goin' down, baby! And rather than swoop outside unseen and carry the plane to safety, Superman instead decides to join the passengers in parachuting down. I like this; it allows the people to be self-reliant and heroic on their own (as best they can). It's typical, of course, of our noble hero to super-scan the parachutes to make sure they are all functional, which is why he takes the one bum bumbershoot in the plane. Isn't panel five a fine depiction (for a comic book) of the Northern Lights? And the parachuters look pretty cool, too. Although artist Curt Swan spent most of World War II behind the lines drawing for Stars and Stripes, he DID go through basic training and had surely seen parachute landings performed (with varying skill). The guy in the foreground may have come in a little rough, but he's a civilian! I'm sure that he agreed with the old pilots' saying that "Any landing you can walk away from, is a good landing." Of course, our Super-Hero doesn't have that problem, even when he drops "like a stone." What a nice one-point touchdown! What will happen when Clark (Superman) Kent joins the ragtag bunch of marooned plane passengers? What new threats will he face? 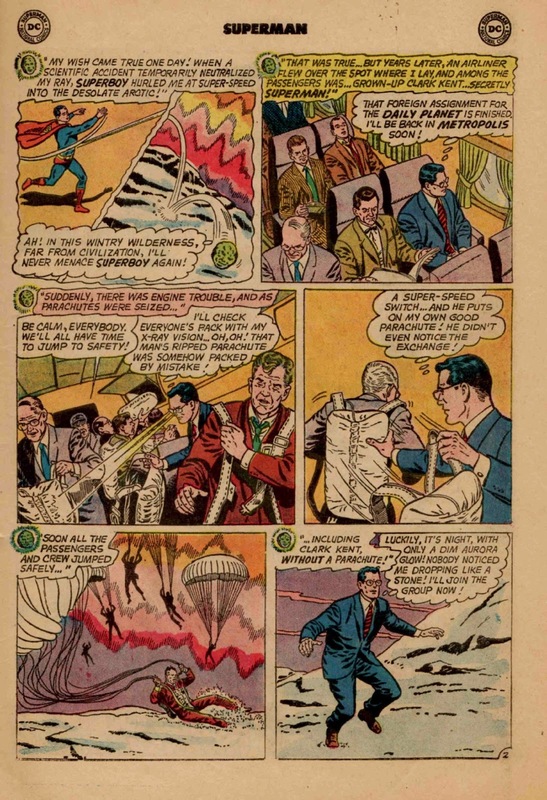 Will the presence of Green Kryptonite thwart Superman's rescue of these people in the Arctic wastelands? 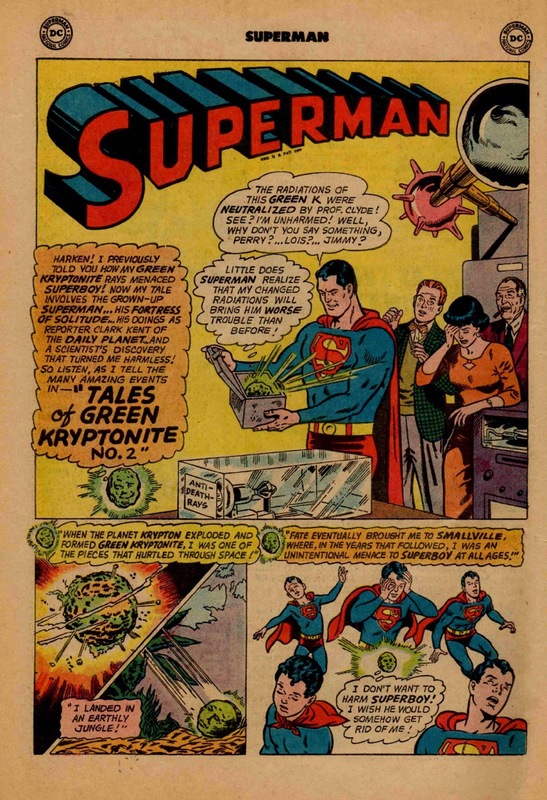 Return for Part Two of "Tales of Green Kryptonite, No. 2" -- at this blog, next week! 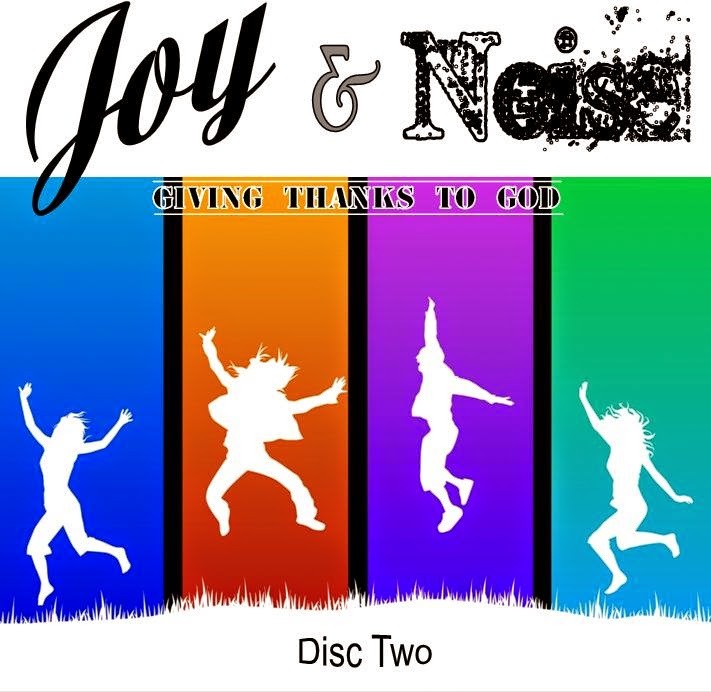 This is one of the compilations of songs that make me think, smile, cry, and be thankful. There are many places where you can buy their albums, just do a web search on their names! As an eight-year-old, I usually gave short shrift to the pages of ads or text or what-have-you that lurked between the stories in comic books. This 1964 issue of Superman #176 was probably the same. But nowadays, each artifact of this nearly 50-year-old comic can stand a LITTLE attention or examination, seems to me. 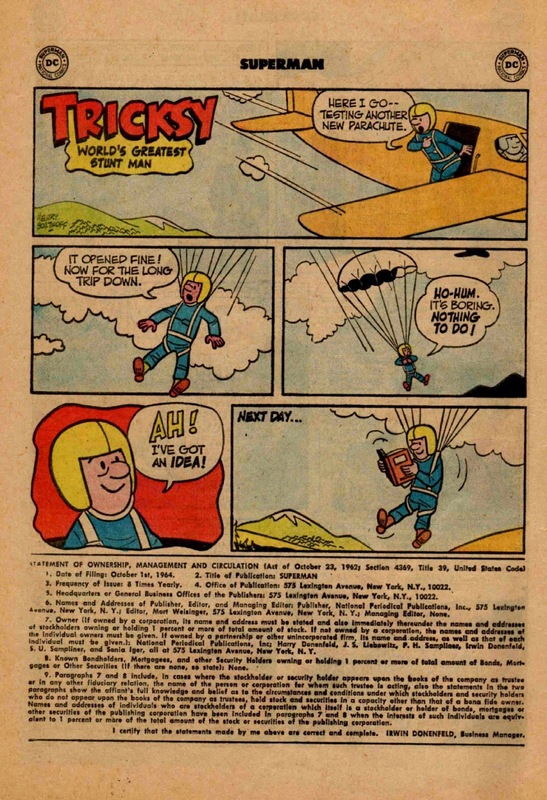 I don't recall any other appearances of "Tricksy, World's Greatest Stunt Man," but according to comicbookdb.com, this was the 13th of 16 appearances as filler, always for DC, in a span from 1958 to 1974. And I agree completely with his solution to a boring activity. I used to read while walking home from school. When I joined a gym recently, I was disappointed to find that while there were earphone jacks on the treadmills and other equipment to watch the TVs, there was no flat surface on which to rest a book. What better combo than reading and burning unsightly fat? A 1962 law required the publication of a "STATEMENT OF OWNERSHIP, MANAGEMENT AND CIRCULATION." Among other things, we read the legal yet magical title, "National Periodical Publications, Inc." The Editor is good ol' Mort Weisinger. Under owners, the only names not readily familiar to me are "P H Sampliner" (a magazine distributor), "S U Sampliner" (I assume a relative of his), and "Sonia Iger," who was Irwin Donenfeld's sister. I don;t understand all the other legalese. For example, Number 7 might mean that NPP was entirely privately held (no stockholders over 1 percent listed), or it might mean the company had no mortgage debt ... I'm not sure. So I'll do now what I did then, skip over the stuff I don't get! 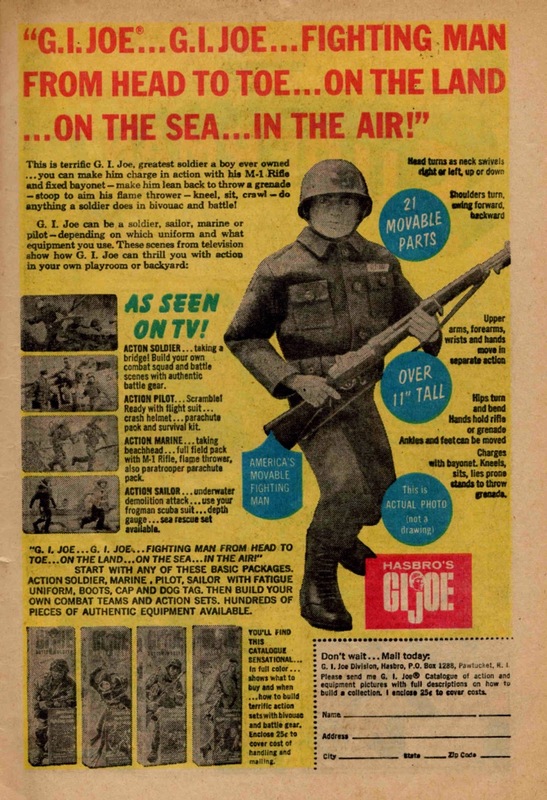 Now, I never had a GI Joe. I certainly had tons of soldier stuff, from a Union Soldier hat (we played "Silver War" because we didn't understand the pronunciation OR THE MEANING of Civil War) to a combat set bought for $5 of birthday money. This Combat Set (by Marx!) contained a submachine gun and a 45 automatic, a periscope, and a plastic helmet. I still remember the rattle-ratchet sound of the machine gun! But for some reason I never had a Joe, although other kids on the street did. My only Joe-llectible (a cool word I just now invented) is one of his footlockers, which I came across somewhere and used for an art-supply box when I took art in high school. See you tomorrow for another new music compilation, and on Friday for the beginning of the SECOND story in this comic! Dumb Animals Heap Plenty Smart! 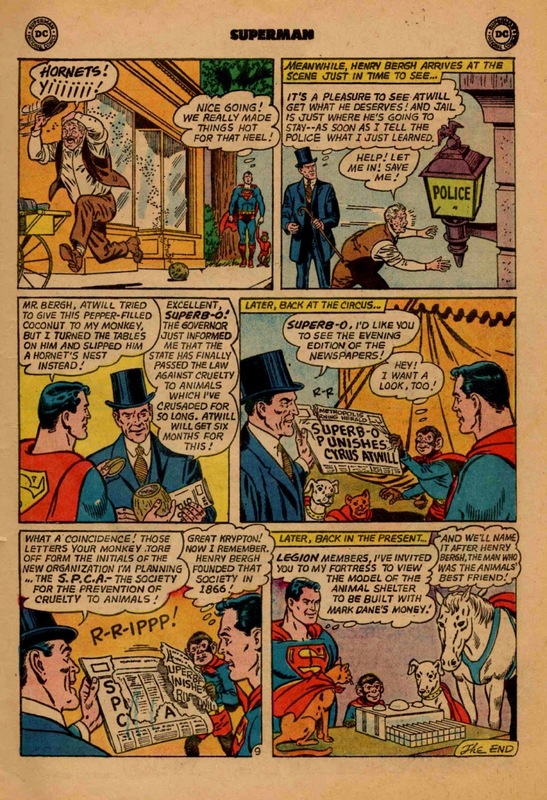 Superman, along with Beppo the Super-Monkey, Comet the Super-Horse, Comet the (sometimes) Super-Cat, and Krypto the Super-Dog have traveled back in time to 1866 ( a hundred years in the past) as a circus performer and his animal troupe, to investigate the forgotten misbehaviors of one Cyrus Atwill, a man whose animal cruelty is so legendary within his family that a nephew, in the present day, has endowed a $2 million animal shelter to atone for Atwill's sins. 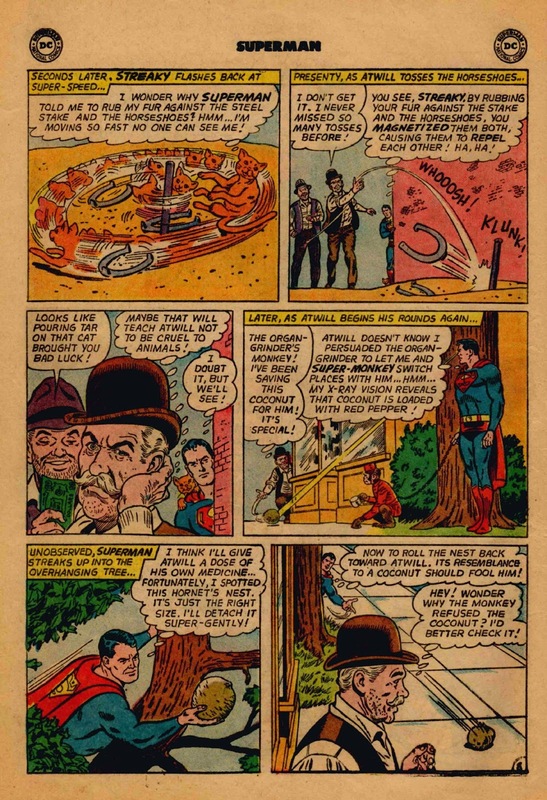 So far, Superman and his herd have met Atwill, and seen him do everything from pouring tar on a (Super) cat to whipping horses and kicking dogs. Interestingly, another fellow in 1860s Metropolis, Henry Bergh, is a "snooping do-gooder" who, as an antithesis to Atwill's cruelty, been standing up for the decent and proper treatment of animals, especially servant animals. He smiles with relief when Superman surreptitiously "jams" a water pump open so that overheated dray horses can drink their fill on a hot day. Streaky doesn't know why he was told to rub his fur against Atwill's horseshoes (at invisible super-speed), but we readers see (and are told by a helpful thought balloon) that all that cat-hair rubbing (sounds like a Ted Nugent song) did a little magnetic re-arranging. The steel post and the iron horseshoes repel each other, and Atwill can't make a single ringer! Soon after losing his money, we see the depths of meanness in Atwill's heart. Not only is he opportunistically cruel to animals, HE PLANS THINGS. Some time earlier, he found a coconut, hollowed it out, and filled it with red pepper ... all to torment Superb-O's sweet little panhandling monkey. The top left panel of this page is priceless! I'd say, mean ol' puddy-tat -- er, nasty ol' Cyrus Atwill, has gotten what's coming to him! I'd like to hear Atwill explain to the police how he came to mistake a hornet's nest for that spiked coconut. Can't you just imagine a cop taking Atwill back to the street and asking him to "identify" his coconut by taking a big sniff? Also, isn't it refreshing that the actual bad acts of the bad guy causes actual retribution? There's no New-Age change-of-heart, with no consequences for the villain. While it's too bad that in THIS instance, punishment doesn't lead to repentance, that's the way life is sometimes. Care Bear Stares don't always work. I love how Beppo's curious monkey-ness leads to a strategic newspaper tear. And the final panel shows our heroes gazing at a model of the future animal shelter, endowed with money from Mark Dane, the millionaire whose uncle, Cyrus Atwill, was such a heel. This story's over, with a fine moral -- be nice to animals, especially the ones you're in charge of -- and some history, along with some wonderful art of this long-ago period, by Super-Artist Curt Swan. See you Wednesday for our next few pages of Superman #176!